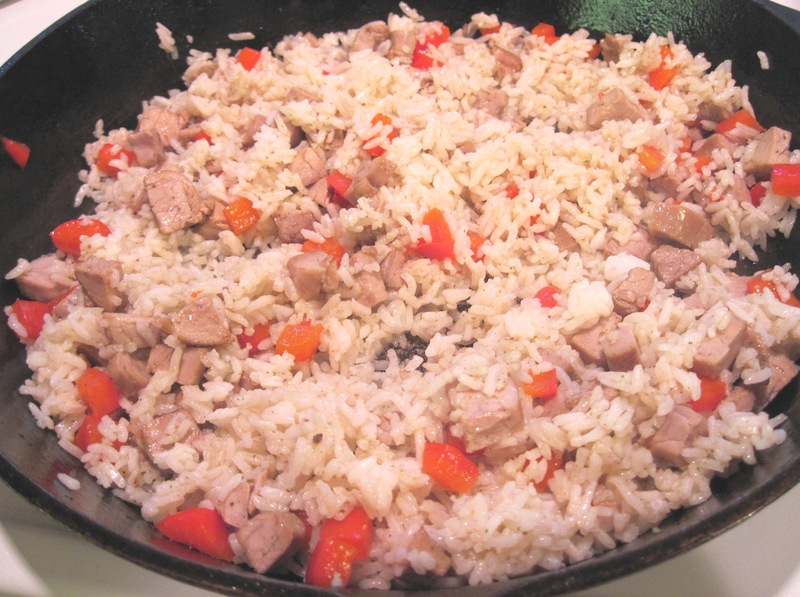 The recipe I use for fried rice is in a little cookbook by Bonnie Tandy Leblang and Joanne Lamb Hayes, called Rice. 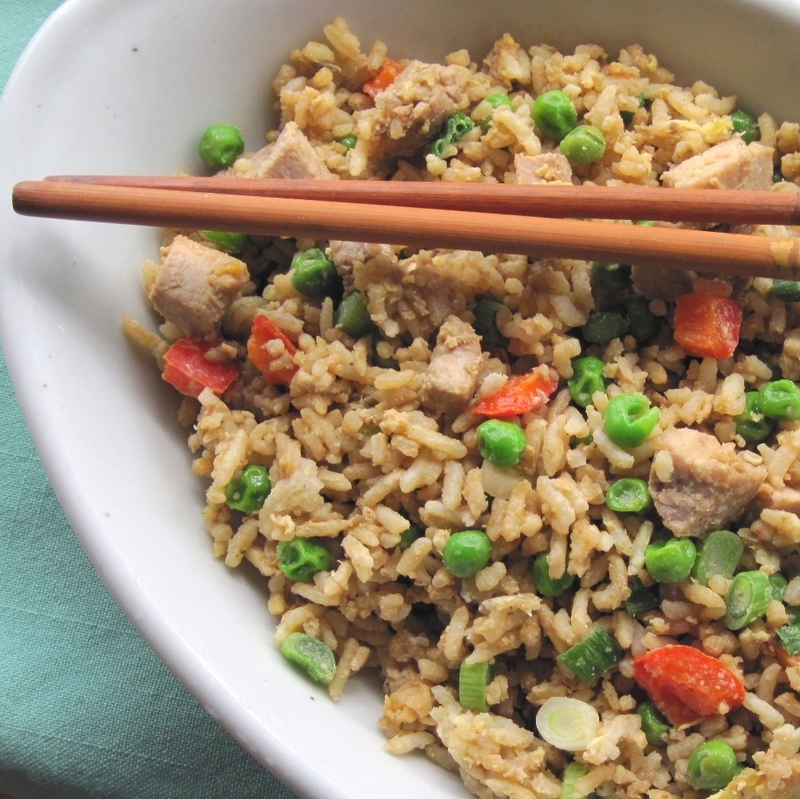 It’s really more of a guideline for fried rice, because the possibilities for variations are endless. I happened to have leftover pork tenderloin, but you could use any leftover meat or seafood. The authors used water chestnuts; I added diced red pepper instead. 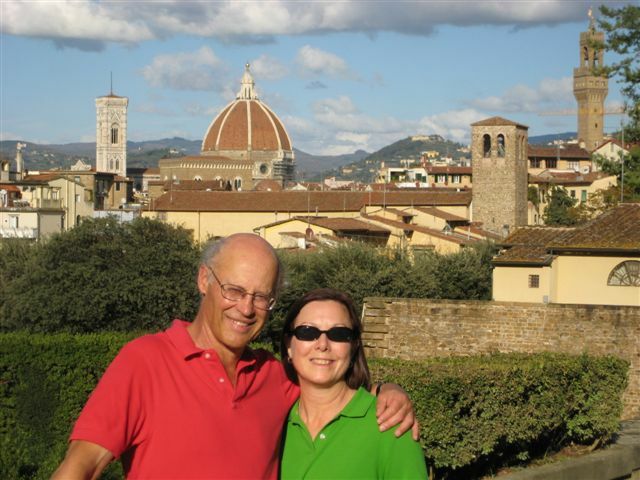 They give suggestions for other substitutions: bamboo shoots, bean sprouts, mushrooms, pimientos, onions, or celery. It’s best to use leftover rice, too. The rice should be cooked ahead of time and refrigerated; refrigeration makes the rice dry out a bit which makes it better for fried rice. Basically, this is a great recipe for leftovers! It’s good enough, though, to cook up a batch of rice to refrigerate just for fried rice in a day or two. This is a stir-fry recipe that goes together very quickly once you start cooking, so have all of your ingredients ready to go. 1. Using your fingers, separate the rice so the grains aren’t stuck together. 3. Add the red peppers (or any other raw vegetable that you’re using) and stir-fry for about 30 seconds. Add the pork and stir-fry for about a minute. Add the rice and stir-fry until it is all well-coated with the oil and warm, but not browned. 4. Make a well in the center of the rice and add the beaten eggs. 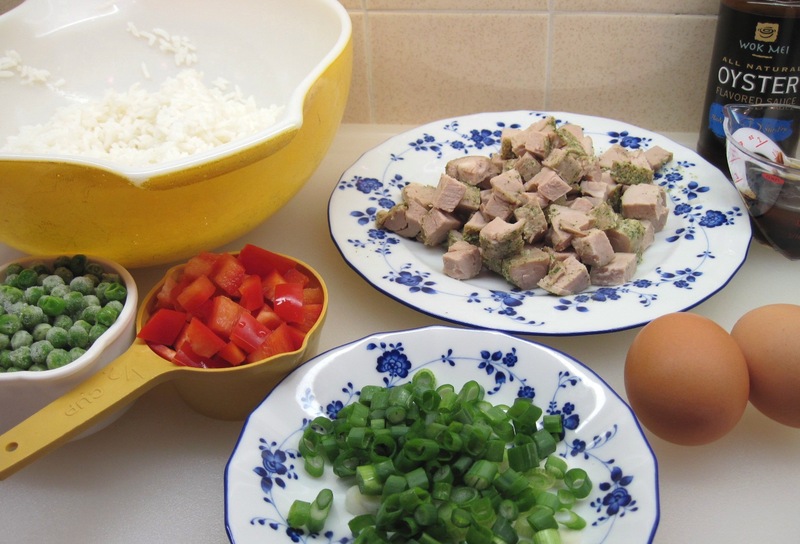 Stir-fry to distribute the eggs throughout the rice. They will cook very quickly. 5. Add the peas, oyster sauce, soy sauce, and sesame oil. Continue to stir-fry for a few seconds. Stir in the green onions and serve. 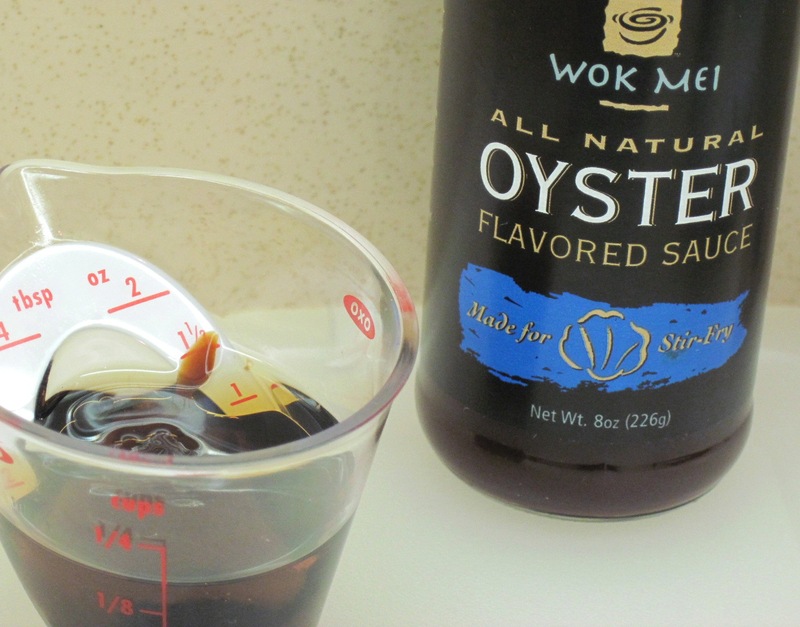 *Ingredient note: I discovered Wok Mei All Natural Oyster Sauce at Metropolitan Market. It’s great and has no MSG, sodium benzoate, modified corn starch, refined sugars, artificial colors, or artificial flavors. It’s gluten-free! Love it! I hope it tastes good, too, Kathy! 🙂 Enjoy! We were searching for dinner ideas last night and decided on this one 🙂 It was good, and easy! We ended up using some beef rather than pork. Thanks for your comment, Michael. Your version with smoked sausage sounds good, too.